Admin User can search Stock, view description of a selected Stock, add Stock, update Stock and delete Stock. 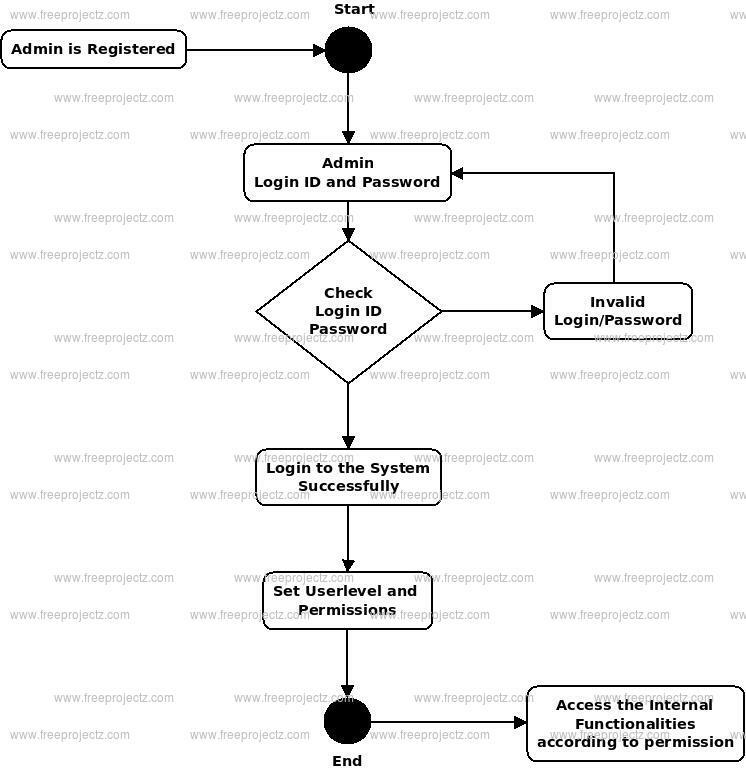 This is the Login Activity Diagram of Jwellary Shop Management System, which shows the flows of Login Activity, where admin will be able to login using their username and password. After login user can manage all the operations on Design, Stock, Product, Quality, Jwellery. All the pages such as Product, Quality, Jwellery are secure and user can access these page after login. 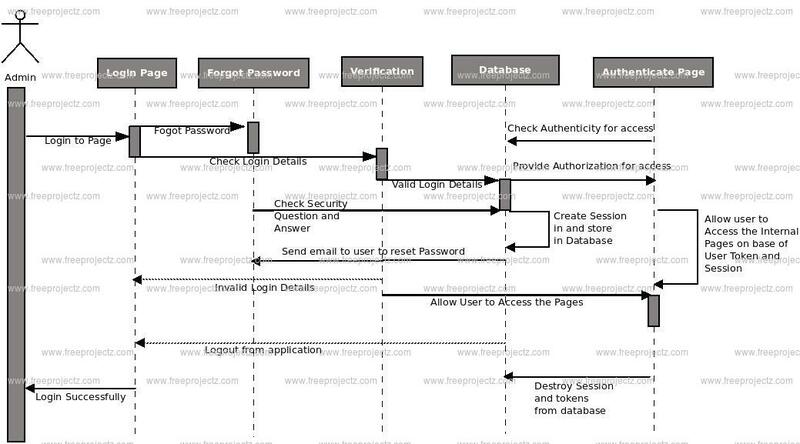 The diagram below helps demonstrate how the login page works in a Jwellary Shop Management System. The various objects in the Quality, Design, Stock, Product, and Jwellery page—interact over the course of the Activity, and user will not be able to access this page without verifying their identity. Jwellary Shop Management System Class Diagram describes the structure of a Jwellary Shop Management System classes, their attributes, operations (or methods), and the relationships among objects. The main classes of the Jwellary Shop Management System are Jwellery, Stock, Sales, Quality, Payment, Product. 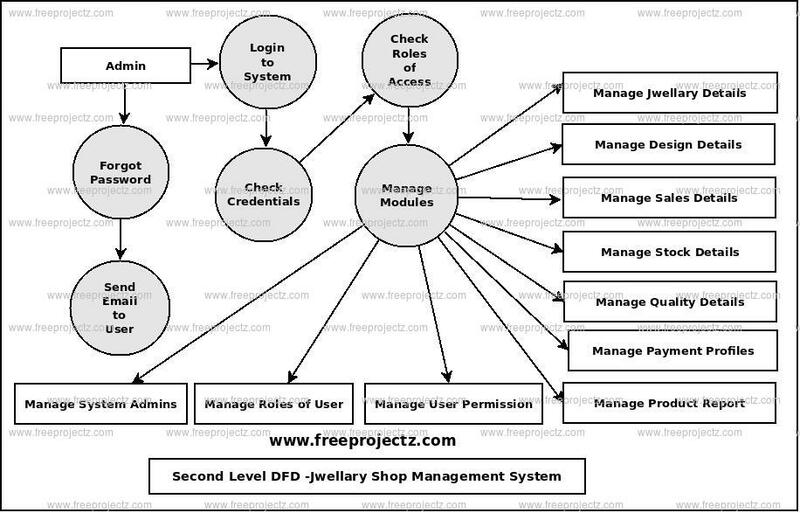 This is a Component diagram of Jwellary Shop Management System which shows components, provided and required interfaces, ports, and relationships between the Stock, Design, Product, Quality and Jwellery. This type of diagrams is used in Component-Based Development (CBD) to describe systems with Service-Oriented Architecture (SOA). 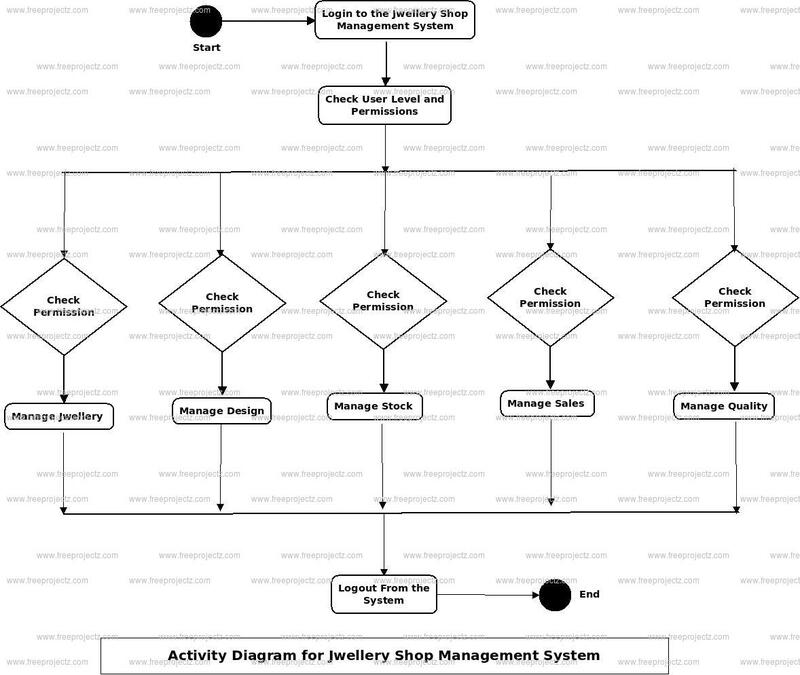 Jwellary Shop Management System UML component diagram, describes the organization and wiring of the physical components in a system. You can show the models the components of Jwellary Shop Management System. 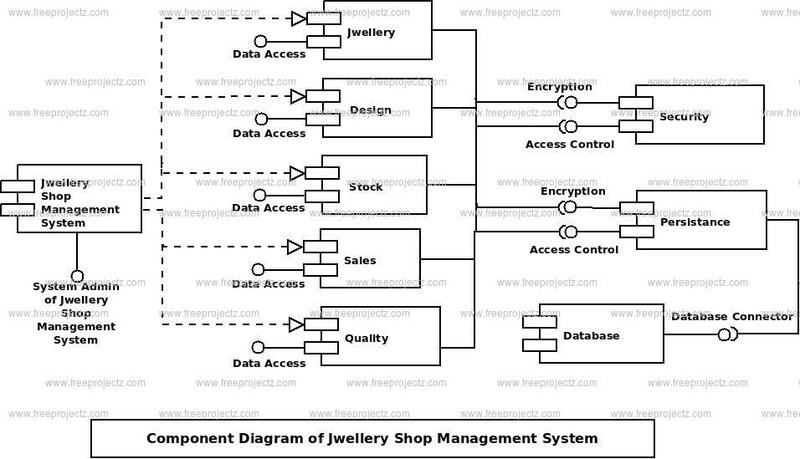 Jwellary Shop Management System Data flow diagram is often used as a preliminary step to create an overview of the Jwellary without going into great detail, which can later be elaborated.it normally consists of overall application dataflow and processes of the Jwellary process. It contains all of the userflow and their entities such all the flow of Jwellary, Design, Stock, Sales, Quality, Payment, Product. All of the below diagrams has been used for the visualization of data processing and structured design of the Jwellary process and working flow. This is the Zero Level DFD of Jwellary Shop Management System, where we have eloborated the high level process of Jwellary. It’s a basic overview of the whole Jwellary Shop Management System or process being analyzed or modeled. It’s designed to be an at-a-glance view of Quality,Payment and Product showing the system as a single high-level process, with its relationship to external entities of Jwellary,Design and Stock. 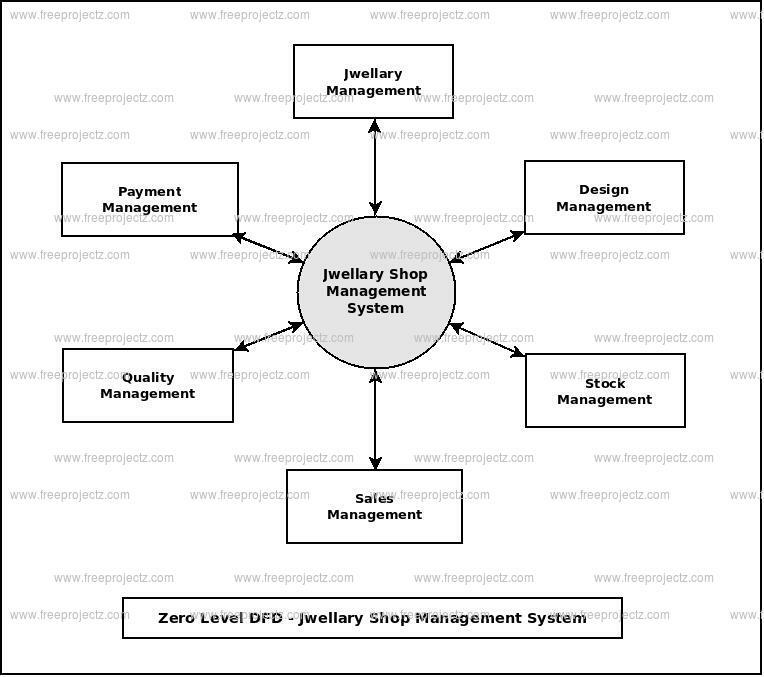 It should be easily understood by a wide audience, including Jwellary,Stock and Quality In zero leve DFD of Jwellary Shop Management System, we have described the high level flow of the Jwellary system. First Level DFD (1st Level) of Jwellary Shop Management System shows how the system is divided into sub-systems (processes), each of which deals with one or more of the data flows to or from an external agent, and which together provide all of the functionality of the Jwellary Shop Management System system as a whole. It also identifies internal data stores of Product, Payment, Quality, Sales, Stock that must be present in order for the Jwellary system to do its job, and shows the flow of data between the various parts of Jwellary, Stock, Payment, Product, Quality of the system. DFD Level 1 provides a more detailed breakout of pieces of the 1st level DFD. You will highlight the main functionalities of Jwellary. DFD Level 2 then goes one step deeper into parts of Level 1 of Jwellary. It may require more functionalities of Jwellary to reach the necessary level of detail about the Jwellary functioning. 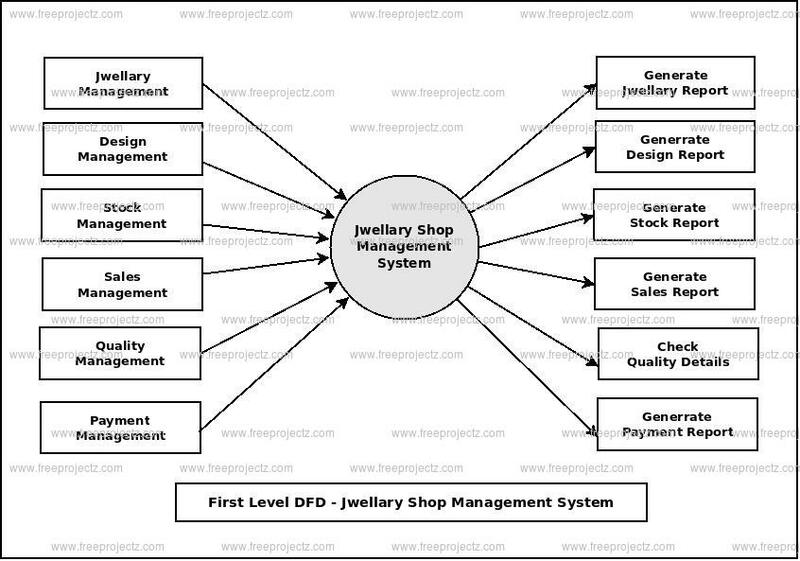 First Level DFD (1st Level) of Jwellary Shop Management System shows how the system is divided into sub-systems (processes). The 2nd Level DFD contains more details of Product, Payment, Quality, Sales, Stock, Design, Jwellary. 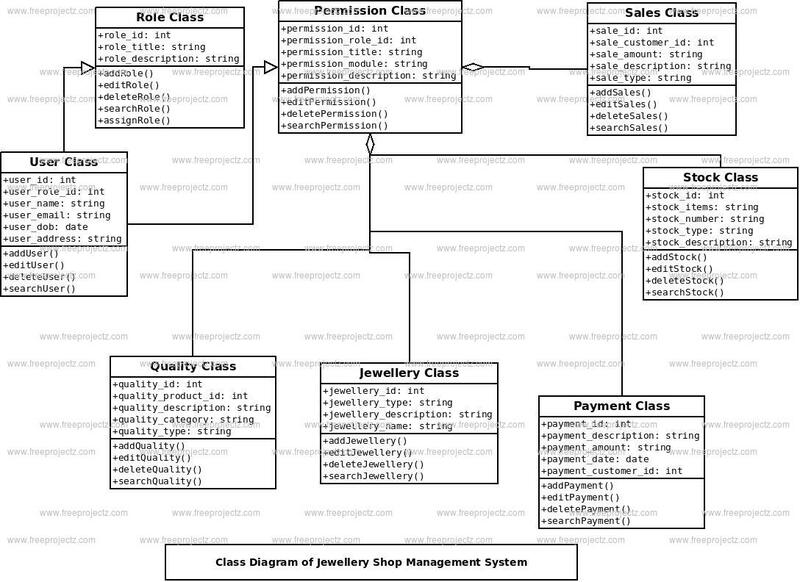 This ER (Entity Relationship) Diagram represents the model of Jwellary Shop Management System Entity. 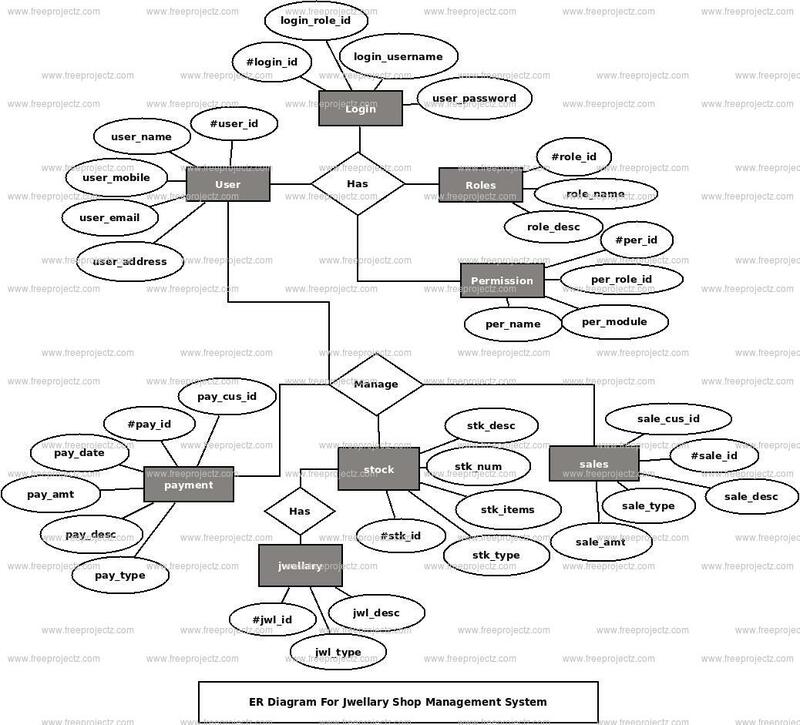 The entity-relationship diagram of Jwellary Shop Management System shows all the visual instrument of database tables and the relations between Stock, Quality, Jwellery, Product etc. It used structure data and to define the relationships between structured data groups of Jwellary Shop Management System functionalities. The main entities of the Jwellary Shop Management System are Jwellery, Stock, Sales, Quality, Payment and Product. Each entity (Product, Sales, Payment, Stock, Jwellery) contains primary key and unique keys. We have implemented indexing on each tables of Jwellary Shop Management System tables for fast query execution. This is the Login Sequence Diagram of Jwellary Shop Management System, where admin will be able to login in their account using their credentials. After login user can manage all the operations on Sales, Payment, Quality, Product, Jwellery. All the pages such as Quality, Product, Jwellery are secure and user can access these page after login. The diagram below helps demonstrate how the login page works in a Jwellary Shop Management System. The various objects in the Product, Sales, Payment, Quality, and Jwellery page—interact over the course of the sequence, and user will not be able to access this page without verifying their identity. This Use Case Diagram is a graphic depiction of the interactions among the elements of Jwellary Shop Management System. It represents the methodology used in system analysis to identify, clarify, and organize system requirements of Jwellary Shop Management System. The main actors of Jwellary Shop Management System in this Use Case Diagram are: Super Admin, System User, Shopkeeper, Customer, who perform the different type of use cases such as Manage Jwellery, Manage Design, Manage Stock, Manage Sales, Manage Quality, Manage Payment, Manage Product, Manage Users and Full Jwellary Shop Management System Operations. 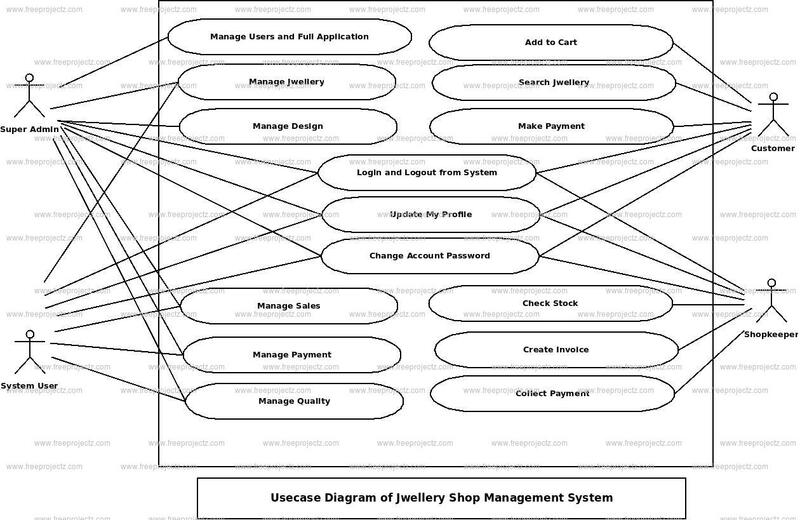 Major elements of the UML use case diagram of Jwellary Shop Management System are shown on the picture below.